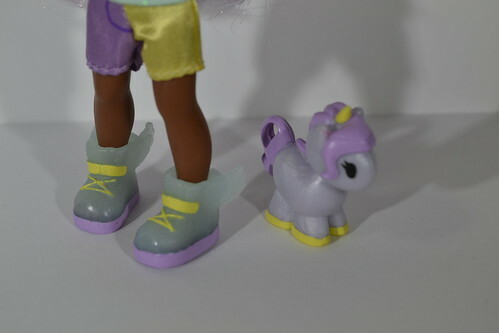 It has been a “Holy Grail” for me to have custom Monster High (or Ever After High) shoes. 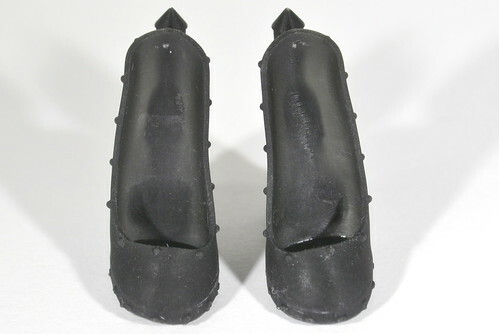 We’ve 3D Printed several things, but shoes have been a hard thing because our printers could not do fine details very well. Fast forward to two weeks ago when my husband told me he invested in an Anycubic Photon Resin Printer. it’s an LCD printer that uses projection to harden UV resin. I’m not going to get any more technical, so please don’t stop reading now! The point is that this printer will allow us to get CRAZY detailed prints. Look how cool this dragon looks! Anyways, you aren’t here for Dragons. We’ve been working on this for some time and I can finally show you a product I am proud of! 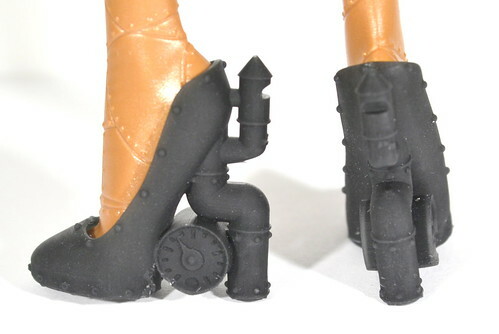 These are my 3D Printed Steampunk Monster High (or Ever After High) Shoes! Greetings everyone! 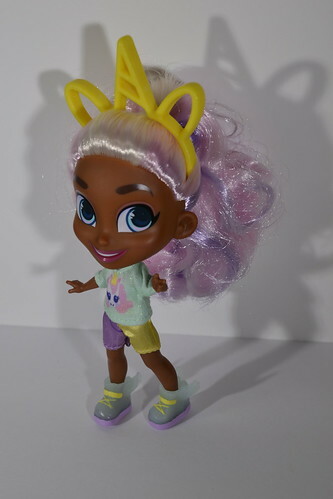 I know it has been forever, but I wanted to share with you the new Hairdorables dolls from Just Play! I purchased my dolls from Walmart. There was a large endcap with the dolls. I calculate that the endcap holds 80 dolls…. No; I haven’t bought them all. 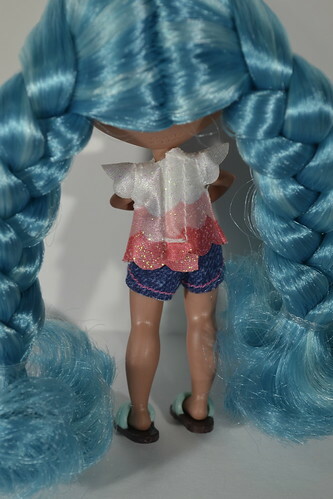 Hairdorables are tiny dolls (the same height as a Shoppie) that come in blind boxes. I have photos over on Instagram if you want to see the boxes, and several more famous YouTubers have already unboxed a few that Just Play sent out. I did not take any pictures of me unboxing a doll, but I did try to do an Instagram Live when I opened my first one. Shout out to the, like three, people that watched that! There are no markings that I can find on the boxes that let you know what you are going to get. Each box is stamped, but that stamp is identical to all of the dolls in the display. I purchased 4 dolls last night when a friend told me that they were there. Out of those four dolls, I got 3 unique dolls and 1 “double”. If you aren’t familiar, a “double” is when you got a doll that you’ve already opened. I’ll refer to it as a double even when its a triple… or a fourth…. etc. Last night I opened Rayne Bow, Cuite Kali, Noah Knows, and another Rayne Bow. I was happy, even with the double, because Rayne Bow is adorable. First up is Rayne Bow. 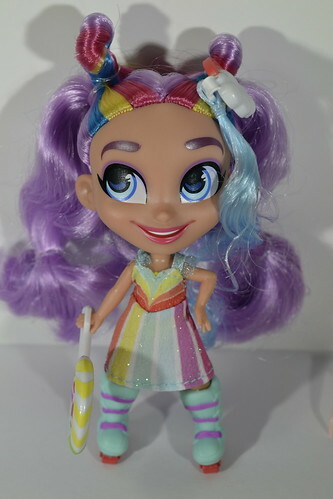 She is an adorable little girl with purple hair and red/yellow/blue streaks. 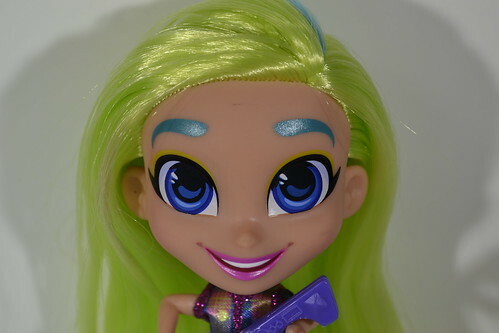 The face paint on these dolls is nice. I haven’t noticed any major problems. Rayne has blue eyes that are looking to the side. I love when dolls do that (and do it well). She has a big open-mouth smile and pink lips. Her hair is in two buns on the top and comes down the back. 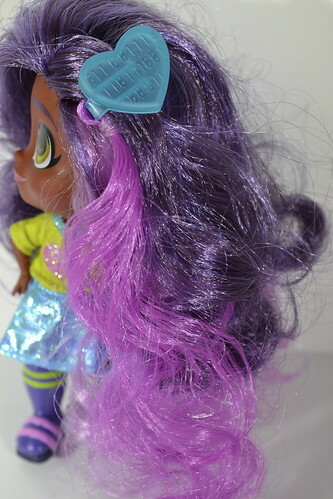 The doll is packaged with the purple strands in bands on the bottom. Rayne wears a cute rainbow print dress. She also comes with a lollipop that she holds nicely. 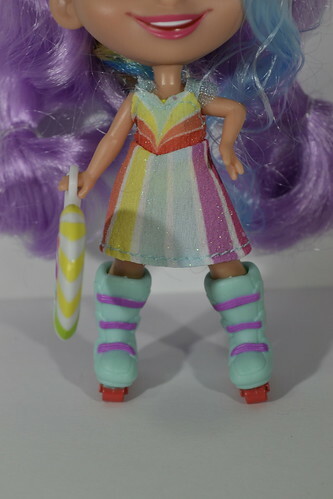 She wears roller skates that are a nice mint color. 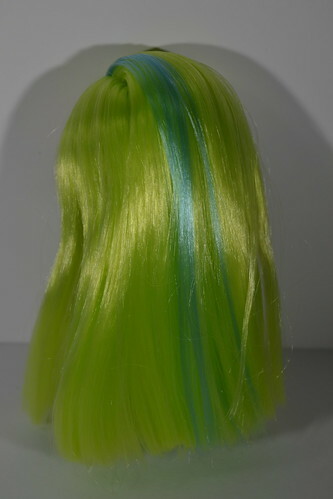 Rayne comes with a hair clip that looks like a rainbow with blue hair coming down. 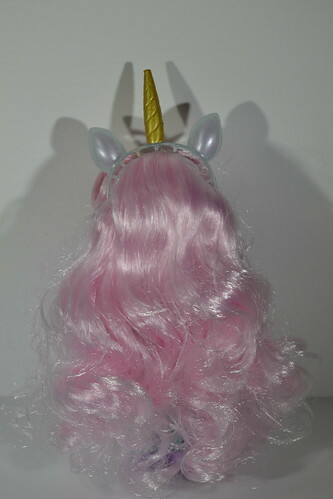 It would look so nice in her hair if I could get the curls to cooperate. 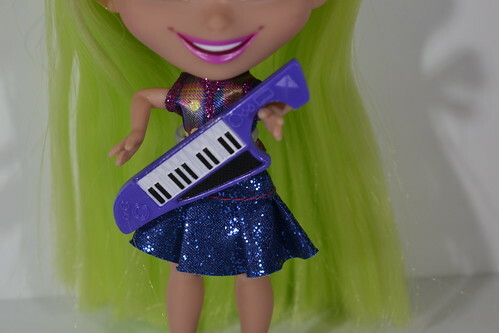 If you’ve ever read a review from me before you know that there are two things I want in a doll: articulation and great hair. These dolls are TINY. They have tiny little legs and arms, but they are still articulated! WHAT! She has movement at the head (she can just shake her head no), at the shoulders, and a full range of motion at the hip. Secondly would be hair. 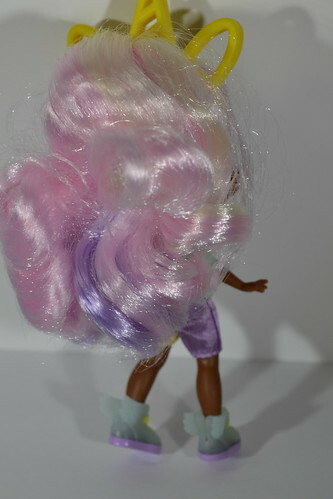 These dolls are sold by their hair…. 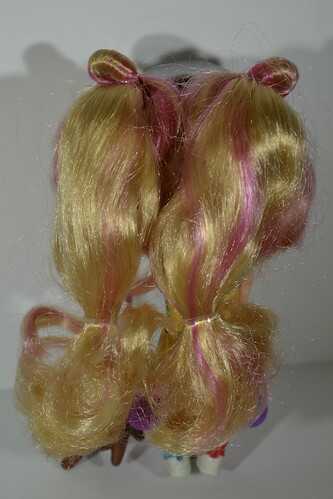 their names ARE Hairdorables…. and the hair is just that, adorable! It is so soft and nice to touch. 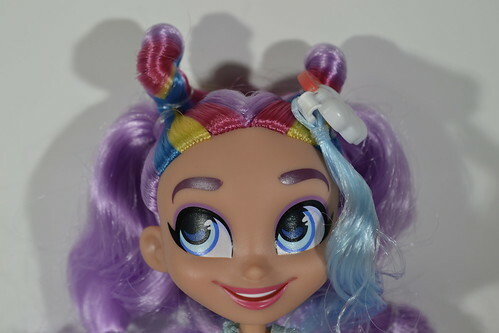 I haven’t messed with Rayne’s hair too much, but I did take the bands out of my double’s hair. The hair is nice and soft. I am so happy about that! 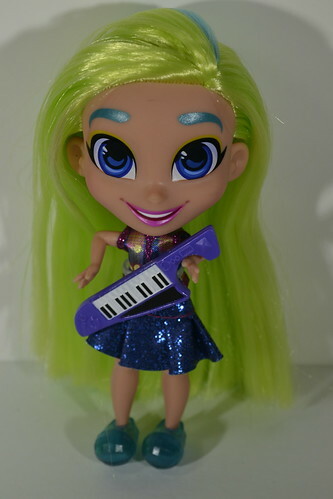 They totally got the hair right! If you’ve watched some of the YouTube videos, you’ll notice something missing….. a stand. 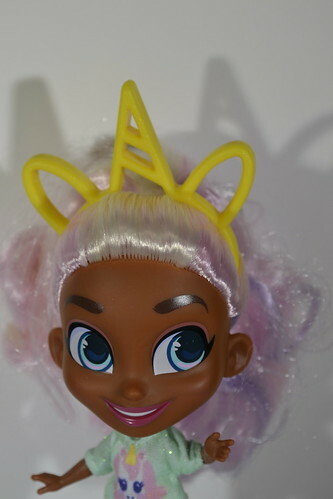 Those YouTubers got dolls that were not from the production line. 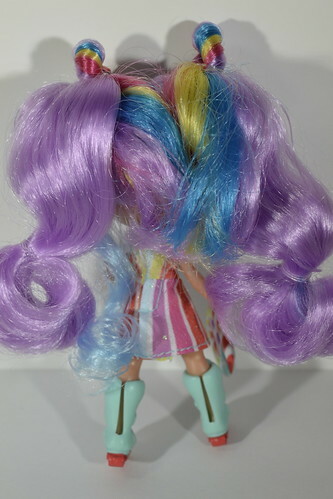 The actual dolls do not come with stands. Or at least, the ones sold at Walmart do not. 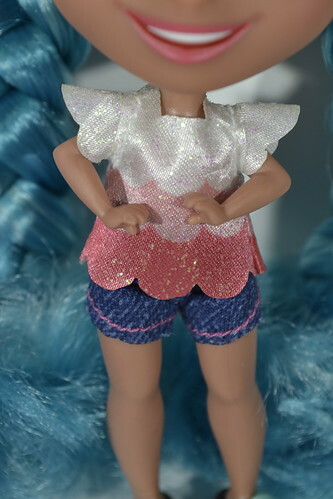 My second doll was another Rayne Bow. I also got a Noah Knows. I was so excited to get a Noah! She’s main character for the line, but this isn’t considered her “signature” look. Noah has a couple of annoying things. Her flip flops are going to get lost. They will not stay on this doll and I’ve already almost lost them once. Her hat also won’t stay on her head. It isn’t quite big enough and keeps flying off. Then I opened a Cutie Kali. I liked Cutie Kali way more last night than I do today. You see, I went back to Walmart (you aren’t surprised are you?) and picked up some more…. way too many…. I bought 8 more this morning. I got them home and started opening them…. and it was so disappointing. Of those 8 boxes THREE OF THEM WERE CUTIE KALI. WHAT?! Now I have 4 Cutie Kali dolls. FOUR! She isn’t THAT cute! Also in that set I got 1 more Rayne Bow (making my total THREE of her) and 1 more Noah Knows (making a total of TWO of her). Seriously?! These things are $12.88 a pop! So I just spend almost $65 on NOTHING. 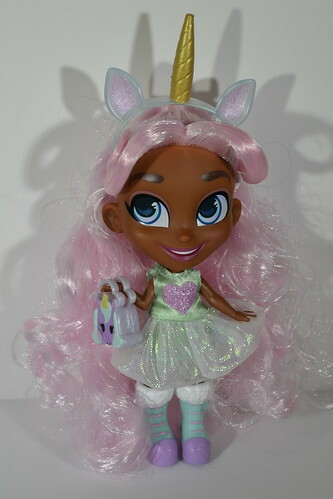 I fully understand that there is a chance when you are buying blind boxes/bags that you will get doubles, but for a line that has 36 characters and a display of 80 dolls….. that means that if each doll could be represented two times with a few in there three. THAT ISN’T THE CASE! I have 4 Cutie Kali and my friend also got one from the same display. That makes 5 Cutie Kali dolls. 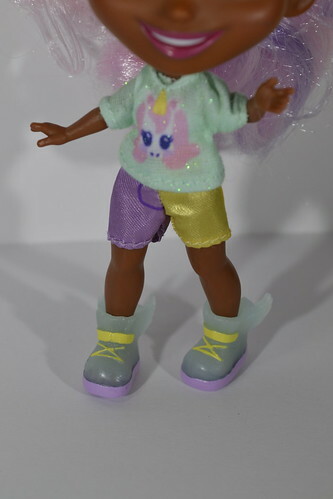 I have 3 Rayne Bow dolls and my friend picked up one as well. I have 2 Noah Knows dolls and my friend also picked up one of those. Between those three dolls, I know there were 5+4+3=12 of the 80 dolls are of three different dolls. That is incredibly frustrating. I understand taking chances, but the fact that the doubles are so concentrated on these three dolls is frustrating. 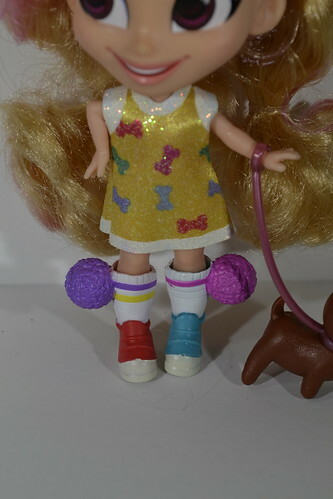 The other three dolls I got this morning were two DIFFERENT Willow dolls and a Harmony doll. This Willow is adorable! Want to know what else? My friend got DOUBLES of this Willow. That makes 3 of this Willow in the set. 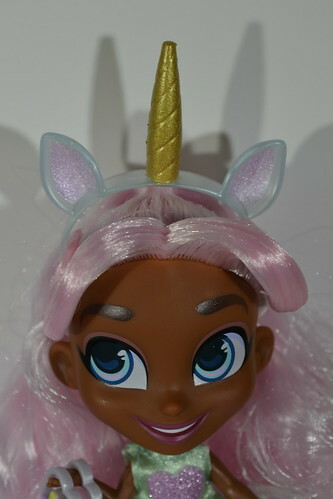 I also got Whimsical Willow; which as of now we have not found a double of. CELEBRATE GOOD TIMES! 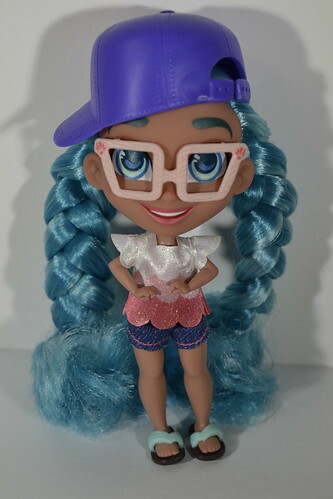 I think this is my favorite doll so far. She is so cute!! 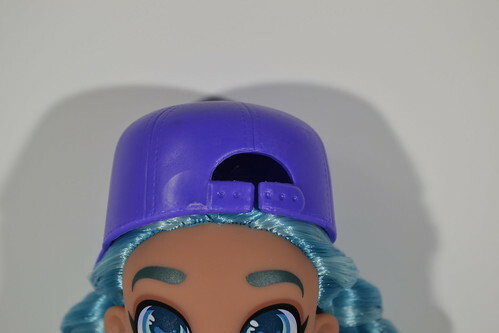 Harmony is a little different than the other dolls because her hair texture is so fine. 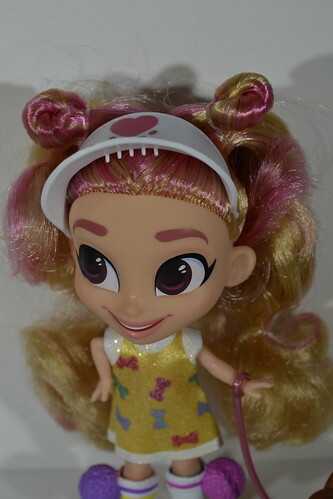 It is still really high quality, don’t get me wrong, but her hair clip has no hope of ever staying in. It’s really cute and I’ve tried a couple of times…. but it is not going to stay. So being super disappointed in all of those doubles, Mr. delSol takes me back to Walmart…. where he buys me four more boxes. How many do you think were doubles? Just guess…. Three. Three out of the four boxes were doubles. Two were Noah Knows and one was another Rayne Bow. So now I have FOUR Noah Knows and FOUR Rayne Bows…. add that to the FOUR Cutie Kali I already have and the one of each my friend got and that is FIVE OF EACH DOLL. 25 of these boxes were of three dolls. 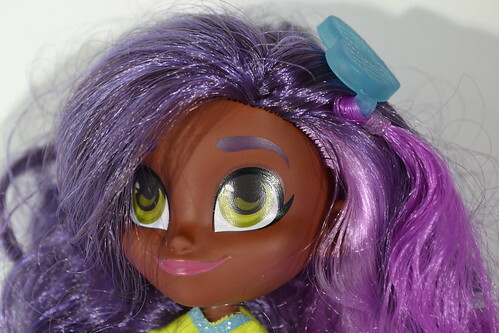 We are seriously going to end up with 36 dolls and all of them are going to be repeats…. It was so sad! And the frustrating thing is that once you rip open that pull tab on the front, there is nothing you can do…. it’s yours now! UGH! Anyways…. 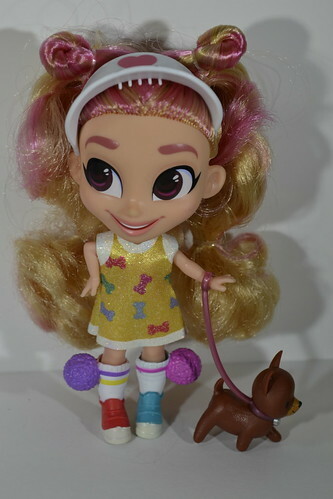 the ONE new doll from that expedition was a Kat Walk, which is kind of a double because my friend pulled one of those yesterday. 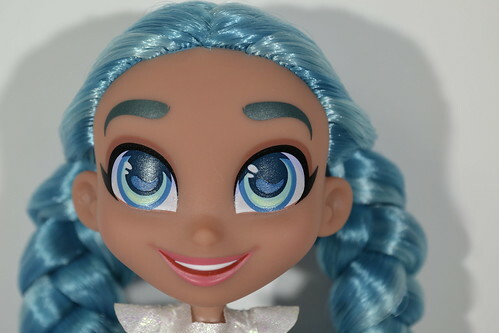 Out of 27 dolls, there are 11 unique dolls. That’s about 41%…..
Now, I know that NORMAL people (parents) would probably only buy their kid one, maybe two, of these at a time. So this might not impact sales at all. But crazy collectors like me…. I might be a little less likely to go back and buy more now. 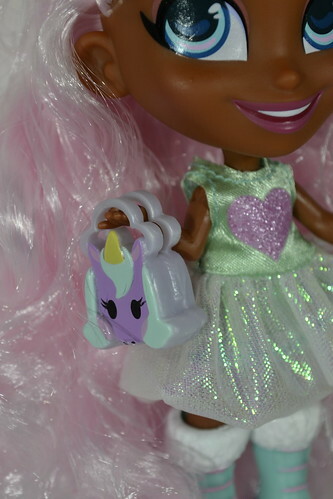 Overall, the hair quality is amazing, the dolls are cute, the gimmick isn’t bad. I just don’t want to own so many of the same doll! 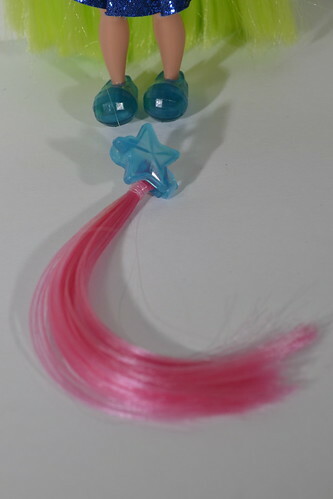 If you are interested in any of my doubles… I’ve put them on eBay.